St. Januarius, bishop of Beneventum, the principle patron saint of Naples, was believed to have been martyred by beheading in 305, at Campania, during the persecution of the Emperor Diocletian. Though there is no reliable history of his life or martyrdom, and no contemporary accounts remain, he is revered as a martyr, and in about 733, the Venerable Bede wrote of Januarius in his Martyrlogium. According to the earliest accounts, Januarius was martyred with his deacon, Festus, and his lector, Desiderius, and several other Christians. The much later document, “Acta Januarius”, gives a detailed account of the martyrdom at the order of Timotheus, president of Campania. The body of Januarius was ultimately re-buried in the Naples cathedral, San Gennaro, in 1497. St. Januarius (San Gennaro), is most famous for the liquefaction of his blood contained within a glass vial, first officially recorded in 1389. This liquefaction has occurred repeatedly for over 700 years; and even after many scientific studies of the phenomenon conducted throughout the past century, it defies natural explanation. 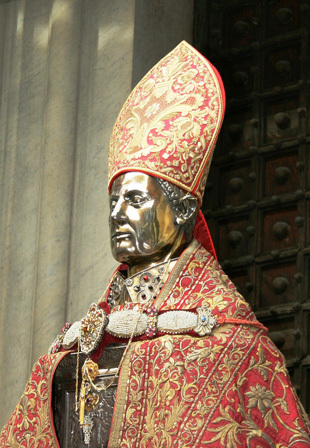 The ceremonial exposition of the miraculous vial of blood continues to this day in the Naples cathedral  on September 19, the feast of St. Januarius, December 16, to celebrate his patronage of both the city and the archdiocesse of Naples, and on the Saturday before the first Sunday of May, to commemorate the reunification of his relics in the special Cappella di San Gennaro in the cathedra. in blessed happiness for all eternity. But recall the former days when, after you were enlightened, you endured a hard struggle with sufferings, sometimes being publicly exposed to abuse and affliction, and sometimes being partners with those so treated. For you had compassion on the prisoners, and you joyfully accepted the plundering of your property, since you knew that you yourselves had a better possession and an abiding one. Therefore do not throw away your confidence, which has a great reward. For you have need of endurance, so that you may do the will of God and receive what is promised. Truly, truly, I say to you, unless a grain of wheat falls into the earth and dies, it remains alone; but if it dies, it bears much fruit. He who loves his life loses it, and he who hates his life in this world will keep it for eternal life. If any one serves me, he must follow me; and where I am, there shall my servant be also; if any one serves me, the Father will honor him.